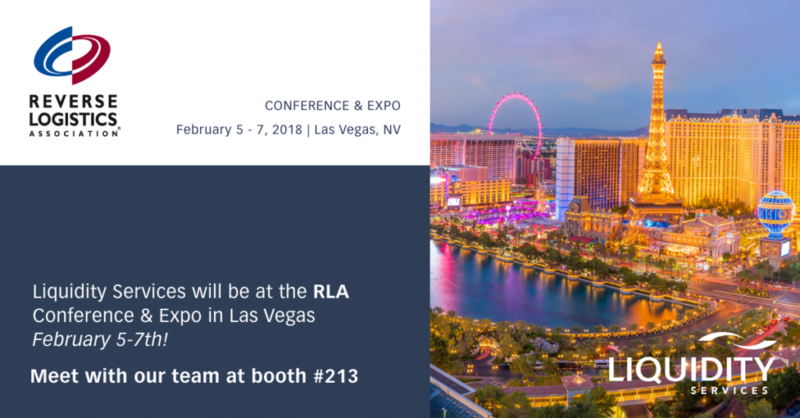 On February 5-7th, Liquidity Services will be attending the RLA Conference and Expo in Las Vegas. This conference is focusing on The Circular Economy. Liquidity Services is the market leader in Reverse Logistics serving the world’s top retailers and consumer OEMs. We help companies find new opportunities to increase recovery on overstock inventory, customer returns, and damaged merchandise. While at the conference, Liquidity Services will be hosting a brand-new event focusing on how social media has made an impact on the returns industry. Our Executive Vice President of RSCG and Board Member of RLA, Jim Rallo, will be moderating this exciting new panel. Dive into the minds of social media influencers who have leveraged social media to grow their business and find new success! If you are attending the show, we invite you to stop by our booth #213 to meet and talk with our team. While you’re there, be sure to drop off a business card and find out how you could win 1 of 3 prizes we are giving away! We do have one-on-one meeting time available if you have specific questions you would like to discuss. Fill out this to Book a meeting with us! One of our team members will reach out to schedule a time. If you would like more information, please check out our website. To take a look at our marketplaces designed for our retail solutions, please visit our 3 retail marketplaces’ websites: Liquidation.com , Liquidation.com Direct , and Secondipity.